As usual this dish is beautiful Lindsay! 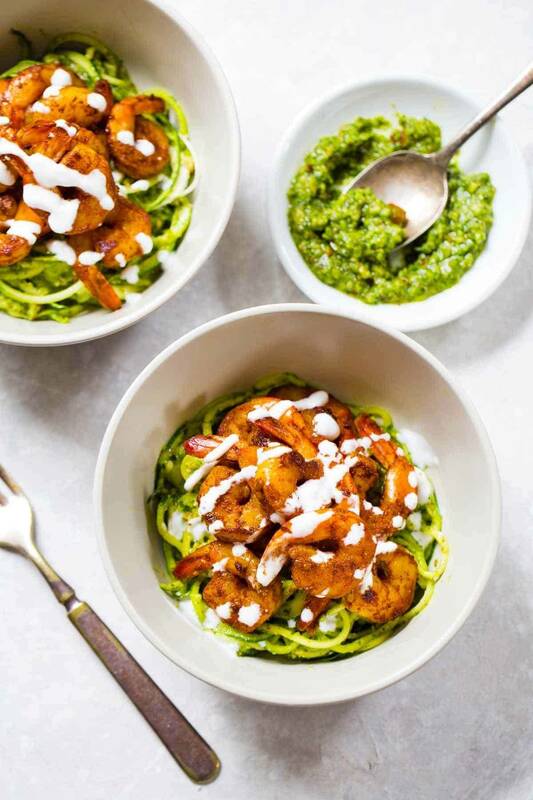 I love the zucchini noodles and pairing this shrimp with it sounds just perfect. Hope you’re having a great long weekend! If I make this, it will be the very first time I use a food processor or blender! I know, go ahead, pat me on the back. A former momma’s boy (notice I did say former) I’m branching out because even though wife is pretty good for me, she’s ready for me to do a few things myself. 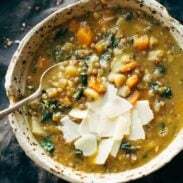 I really need to make this dish for her as she’s looking for more low carb super healthy meals. Thanks Lindsay! You are da bomb. Love the spicy shrimp with the nutty pesto and the oh so satisfying noodles. This is heaven in a bowl! What a brilliant recipe, I had shrimp last week, need to get this one on my meal plan soon looks fantastic and sounds delicious, Thanks! Thanks Joe! Hope you like it! Happy Memorial Day!! I love zucchini noodles!!! And with pesto and shrimp….even better! Great recipe as usual!!! Thank you Deborah! Appreciate that! That pesto alone just sounds so good! I want to make it and put it on everything!! your recipes are always such an ispiration for me! The perfect thing about this recipe is that is so fast to do! Awesome! And I love shrimps. Yeah – it’s seriously SUPER fast! 🙂 gotta love that! I’m allergic to shrimp and almonds and substitutions and that will make this a great recipe? Hey, I would do scallops and use pine nuts instead of almonds. Should have the same effect. Yeah – agreed! Another fish/seafood or even chicken honestly would still be good! And then I’d say just about any kind of nuts – maybe even walnuts? Yummmm! Love shrimp, pesto, and zoodles… your pesto sounds delicious! And thanks for acknowledging those who serve. As a (retired) military wife, we appreciate it. Memorial Day, however, is a day to honor those who have made the ultimate sacrifice and given their lives while serving our Country. Thanks for the comment Judy! I just picked up a basil plant at the store…I’m excited for fresh pesto all summer! This looks fantastic! Anything with the word pesto in it is automatically my favorite thing ever. This weekend I made homemade pesto and then cooked it with some ground beef. Then I added it to fresh pasta and marinara sauce and I was in heaven. What do you use to zoodle your noodles? Hehe, what a funny phrase. I have a zoodler, but I’ve only tried it with spaghetti sauce. This looks green and fresh and different. Looking forward to trying that pesto! Awesome! I hope you like it Susan! I might be drooling over the pictures of that shrimp a little too much and missed it, but did you say what the white sauce drizzled on the shrimp is? Two questions: You said the white drizzled sauce was “like” a runny sour cream/Mexican Crema. So, what do I buy? Also, how spicy IS the shrimp? We’d just buy sour cream and add some water to loosen it up. 🙂 The shrimp isn’t too spicy – chili powder and cumin aren’t too bad! I am always a fan of pesto…no matter how it’s served. I must admit, I always defer back to pine nuts for my pesto so I will have to try it with almonds. Also, I am a pasta fanatic and I am intrigued by using zucchini for the pasta. I will have to try it. Thanks for sharing. Pine nuts are so yummy but so darn expensive! Hope you like this Chelsea! This looks soooooo good! And just in time for swimsuit season! This looks amazing – pretty much combines all my favourite ingredients! This looks very good. Will try this recipe soon. Awesome! I hope you like it Ellen! Such an easy mid-week recipe!! I’m so in love with this recipe! I’m a huge seafood fan especially shrimps, and to combine it with pesto noodles could only make it taste even better! Thanks for the recipe and great pics..
Oh my… looks so good! Love the colors. Thanks! I got the 3 blade! 🙂 It’s great. Ooh fun! All the possibilities!